Last week, we presented a soft launch of the new look for the Disneyland Resort Update. While the content categories and their order remain relatively the same, we now have an enhanced, refreshed look. The new light green button at the top lets you quickly skip ahead (jumping over introductory comments like this) to the major sections by way of a drop-down menu. Clicking on a major section heading, highlighted in light green, will take you to the next one, while the last one takes you back to the top. Each of the News and Views items, highlighted in light blue, will do likewise. There are some other format changes you'll find along the way, and a few more may come along in future weeks. If you encounter an error or problem, please let us know by email, including as much detail as you can about the error (such as your browser and operating system). 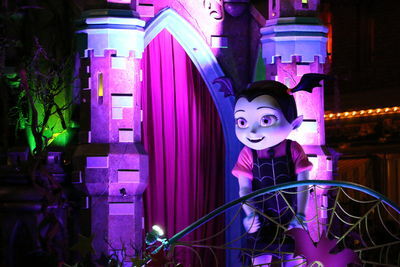 Vampirina, star of the Disney Channel show of the same name, has joined the Frightfully Fun Parade during Mickey's Halloween Party at Disneyland. The character appears on the final float of the parade, along with a host of Disney villains. Vampirina joins the Frightfully Fun parade at Mickey's Halloween Party. Photo by Amber Knight. As of publication, all Mickey's Halloween Party events at Disneyland are sold out online for 2018. Event Dates – September 19, 21, 24, 26, 28; October 2, 5, 9, 12, 16, 19, 23, 26, 29, 31. Call Disneyland and order tickets by phone – a limited number of tickets may be available by phone for events that are sold out on line. Call (714) 781-4636 to purchase by phone. Expect to wait on hold for at least 10 minutes. Visit Disneyland and purchase tickets in person – a limited number of tickets may be available at the Disneyland ticket booths for events that are sold out on line. However, if you tried to purchase tickets by phone and the night you wanted was sold out, they will not be available at the ticket booths. Disneyland Resort Hotels – if you are a guest staying at one of the three Disney-owned hotels (Disneyland Hotel, Paradise Pier Hotel, or Grand Californian Hotel), check with your hotel desk the morning of the event to see if they have tickets available for purchase. Last year, MousePlanet Community Leader Angela told us that a small number of tickets were reserved for Disneyland Resort Hotel guests, and were released for sale at 5:30 a.m. the morning of each party. Officially these tickets are intended only for concierge-level guests, but we've heard conflicting stories about that, and it seems some guests in standard rooms have been allowed to buy the tickets as well. If you're already staying on property, it does not hurt to ask. Angela warns that these tickets sell out very quickly, so don't wait until the party starts to try to make your purchase. Friends or family – if friends/family already have tickets, they may be able to purchase additional tickets the day of the party. Again, a small number of tickets are reserved for same-day sales to help accommodate ticket holders who may have miscounted how many they need, or who had friends/family unexpectedly join them. As with the tickets reserved for hotel guests, these are very limited, and go on sale as soon as the ticket booths open in the morning. If at all possible, get there first thing in the morning to increase your chance of getting tickets. You must have the other event tickets with you the cast member needs to see them, and cannot just trust your word that "so-and-so already has tickets." The Disneyland Resort last week reached an agreement with Unite Here! Local 11, which represents cast members at the Disneyland Resort hotels, to increate minimum wage $15.00 effective January 1, 2019. The minimum wage for housekeepers rose to $15.80. The 2,700 employees covered by the new deal join nearly 9,700 cast members covered by the Master Services Council agreement. …If you're visiting Disneyland on September 30 or October 1, you might encounter some filming around Sleeping Beauty Castle. Disney has filed for a permit for a holiday film shoot these two days. No additional information was available. Matterhorn Bobsleds – closed for refurbishment. Reopening date unknown, but after November 5. Walt Disney's Enchanted Tiki Room – closed for refurbishment. Reopens October 3. Chip 'n Dale Treehouse – closed for refurbishment. Reopens September 27. Main Street Cinema – closes for refurbishment August 14. Reopens September 27. "it's a small world" – closed October 22 - November 6 to install the holiday overlay. "it's a small world" Toy Shop – closed while the attraction is closed. Space Mountain – closed November 1 to remove the Ghost Galaxy overlay. Golden Zephyr – closes for refurbishment September 10–16. The following attractions close September 4 to make room for Super Heroes land. "It's Tough to be a Bug" – closed permanently. Flik's Flyers – closes September 4. The ride will move to Pixar Pier, with a new Inside Out theme, in 2019. Francis' Ladybug Boogie – closes September 4. Heimlich's Chew Chew Train – closes September 4. Princess Dot Puddle Park – closes September 4. Tuck and Roll's Drive ‘Em Buggies – closes September 4. Wetzel's Pretzels – closed for refurbishment. Reopening date unavailable, but after October 28. Napolini – closed for refurbishment. Reopens October 16. Earl of Sandwich – scheduled to reopen for a limited time. Mickey's Halloween Party at Disneyland – September 19, 21, 24, 26, 28; October 2, 5, 9, 12, 16, 19, 23, 26, 29, 31. All events are sold out online, but tickets may be available for select nights at the main entrance ticket booths. Utah schools Fall break – Look for related crowding October 18–23, with holiday-level crowds on Friday, Saturday and Sunday, October 19–21. Dapper Day Fall Outing to Disneyland (unofficial event) – Sunday, November 4. More information at the event website. This popular event grows larger each year, so it's worth making note of the date if you plan to visit the park during this weekend. Mickey Mouse's 90th birthday – November 18, 2018. Celebration cavalcade planned to commemorate the day, and a special moment at Sleeping Beauty Castle. * So Cal Resident tickets expired May 24, 2018. Click here for additional terms and conditions.